On a recent spring day, around two dozen residents of Blish Point in Barnstable gathered to discuss flooding in their neighborhood with town and state officials. The storm that flooded Tess Korkuch’s neighborhood was six months ago, but the images are fresh in her mind and at her fingertips. She has photos and videos on her phone—a neighbor's bocce court three feet underwater, more water pouring through the streets—and she’s ready to show them to anybody who asks. A back deck in Blish Point flooded during a severe storm in January 2018. During high tide, the water went over the second step. It was high tide when the flash-flooding happened. Water came rushing in from both sides—from Barnstable Harbor to the north, and Maraspin Creek to the south. Homes were damaged. The fire department had to rescue people with a high water truck. In the past three winters, Blish Point has flooded five times. After this winter’s storms, the residents got organized. 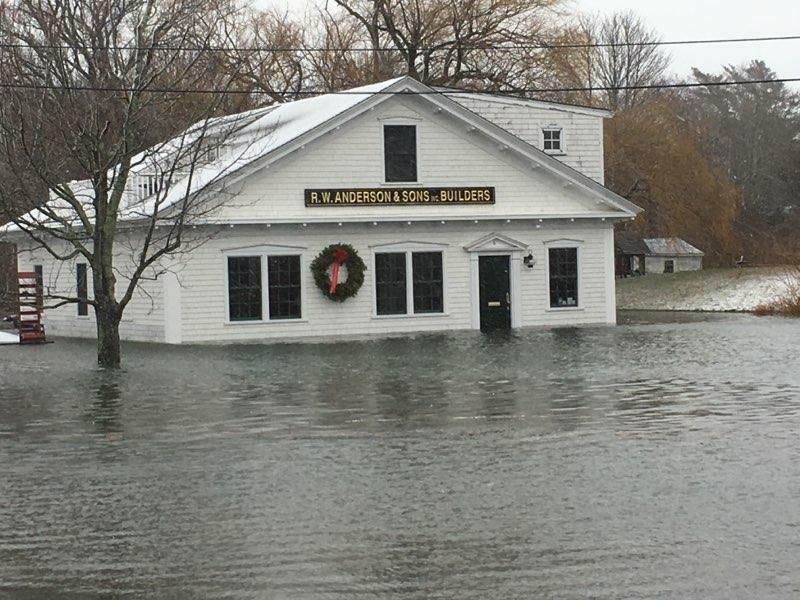 They petitioned the Barnstable Town Council to help them end extreme flooding. They proposed solutions like cleaning the storm drains, building up roadside berms, and fast-tracking building permits for flood-damaged homes. And they invited State officials to come walk around the neighborhood and see the storm damage. A bocce court under 3 feet of water in Blish Point, January 2018. 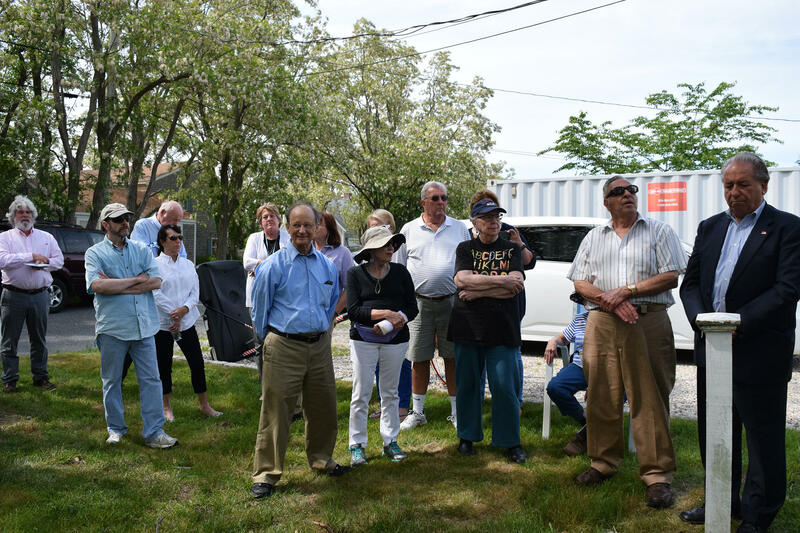 On a recent spring afternoon, around two dozen neighbors gathered on a lawn across the street from the marsh that overflowed in January, to greet State Representative William Crocker and State Senator Julian Cyr, and town officials. Representative Crocker has earmarked $50,000 for Blish Point dune restoration in the proposed House Budget. "We have to plan where we're placing our infrastructure...with respect to climate change," he said. Senator Cyr commended the Blish Point residents for organizing. "This is really impressive that the community is coming together," he said. "When you're speaking with one voice, that will help us advocate on behalf of you folks." Longtime resident Doug Payson believes the neighborhood’s vulnerability to storms and flooding has reached a tipping point. He recalled a period in the 1980s when the neighborhood flooded six times, during a period of severe storms. "I think what's different now is that this is the new normal," he said. Kristina Dahl is a senior climate scientist for the Union of Concerned Scientists, and her research supports Payson's assertion. "We thought we understood the risks [of living along the water]," she said, "But unfortunately, as sea level rises, those storms can just extend their reach farther inland, and we are entering a period where we're experiencing flooding like we haven't in the past." Dahl and her colleagues have just released a new report looking at rising seas, chronic floods, and their impacts on coastal real estate across the country. For Blish Point, they found that there are about 115 homes at risk of experiencing chronic, high-tide flooding—on average, every other week—by 2100. The study expects the flooding to get worse in Blish Point later in the century, which gives them time to plan. But other parts of the Cape are even more vulnerable. In just 30 years from now, more than 500 homes could be chronically flooded, in areas like West Yarmouth, Dennis, Chatham, and Harwich. Many more homes are at risk on the islands. 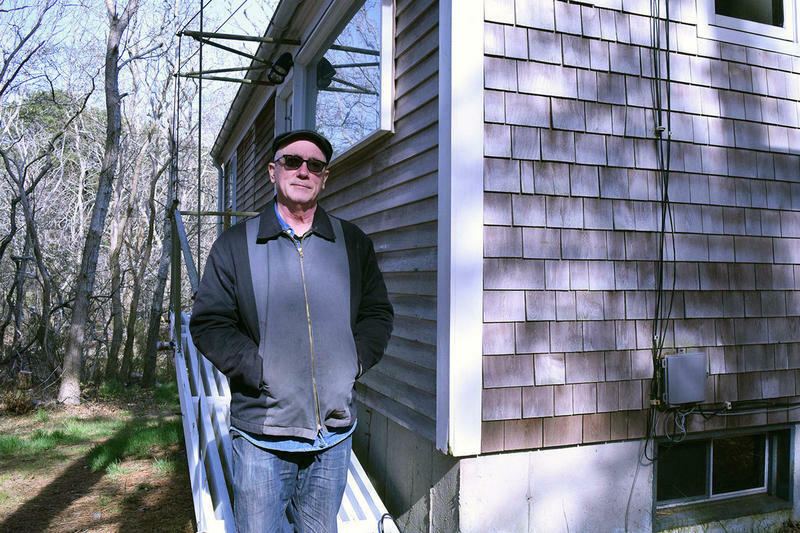 Back in Blish Point, Peter Halesworth says that the neighborhood and the town depend on each other. "It's a small area, it's only about eight streets, but contributes nearly $2 million a year in property tax revenue," he said. "That would pay for the salaries of all the firefighters in town." The damage from this year’s storms is still visible in the neighborhood, but for Halesworth, it’s not all gloom. While the neighborhood experienced four flood days in 2018, "361 days of the year we're OK," he said. "To send up the white flag and surrender is the wrong approach." Climate change is personal here. The community is staring down sea level rise from its living room windows. There are no easy fixes, but the “Blish Point Citizens” are organizing and trying to fight back. Pien Huang is a reporting fellow with the GroundTruth project, stationed at WCAI. 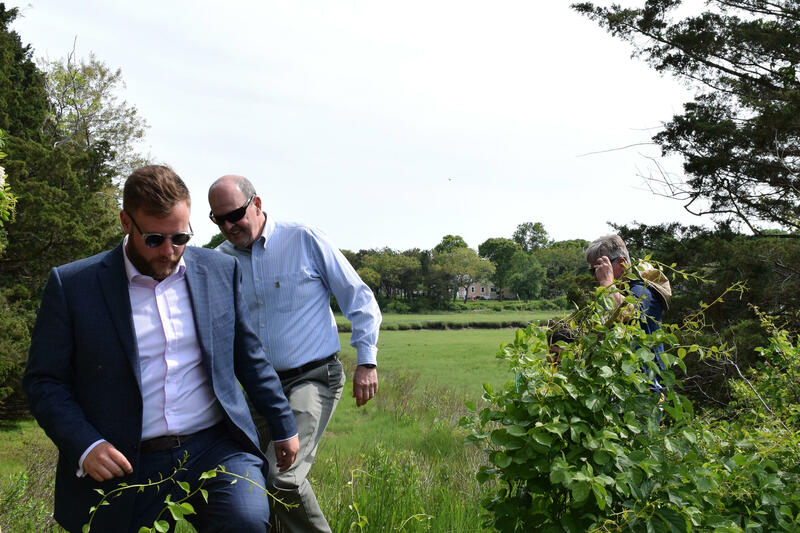 Massachusetts State Senator Julian Cyr and Blish Point resident Doug Payson tour a marsh that overflowed in January. Nationwide, 2017 was a record year for high tide flooding across the country, according to a new analysis out from the National Oceanic and Atmospheric Administration. And that trend is projected to continue into 2018. In coastal communities across Massachusetts, people are starting to take notice. 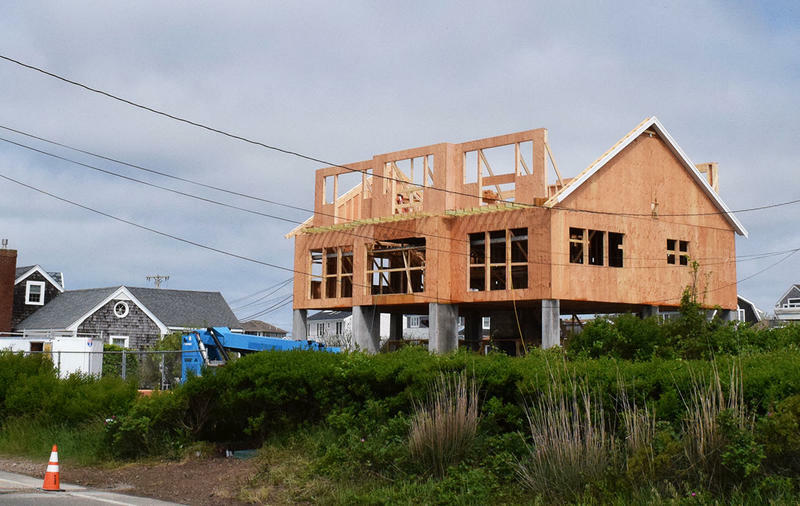 As surely as the sea level will rise, new homes on Surf Drive in Falmouth are going up—and up. Meryden Kirby and her husband Bruce were not home the night of March 2nd, when the ocean pulled the foundation out from under their house. They had heard the forecast, and knew they should leave. 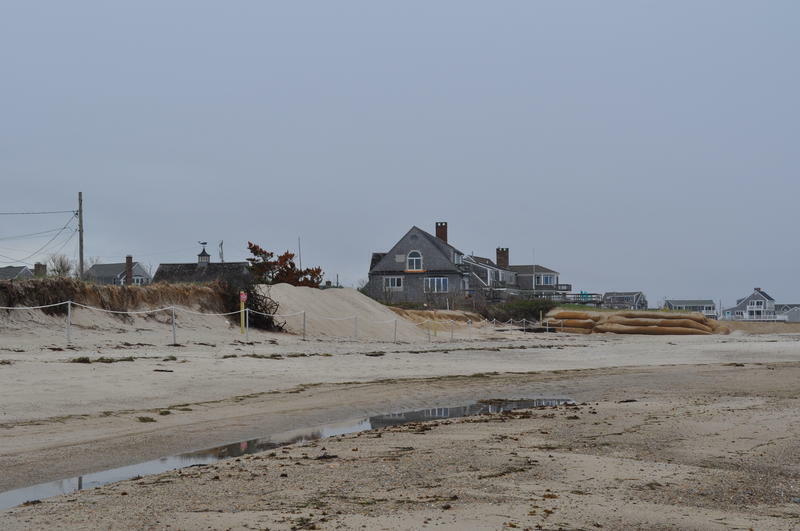 Their home of 20 years, on Wood Avenue in Sandwich, was perched right on Town Neck – a beach that has eroded away dramatically in recent years. The repeated damage caused by intensifying storms and coastal erosion is an issue facing many towns across the Cape region. Last week, Sandwich voters said it's worth $2 million to rebuild the town's marquee structure, even without any assurances about how long it'll last, or how well it'll hold up to the next storm. In the first week of February, Peter McMahon had the worst morning. He tried to make coffee with his tap water—and realized it was salt water.